DepEd CARAGA Unnumbered Memorandum dated September 24, 2018, entitled: Guidelines on the Reimbursement, Granting and Liquidation of Cash Advances of Travel Expenses, is hereby attached for the information of all concerned. a. Travel shall cover only those that are urgent and extremely necessary, will involve the minimum expenditure and are beneficial to the agency and/or the country. b. No cash advance shall be given unless for a legally authorized specific purpose. c. No additional cash advance nor reimbursement of travel shall be allowed to any official or employee unless a proper accounting of the previous cash advance for travel given to him is first liquidated and/or settled. d. Cash advance and reimbursement of travel expenses shall be made only upon submission of proper and complete supporting documents per checklist for cash advance/reimbursement of travel expenses provided by the accounting unit. e. Transfer of cash advances from one Accountable Officer to another shall not be allowed. f. Claim for reimbursement of travel expenses shall be submitted to the Budget Unit within thirty (30) days after the end of each travel, otherwise, it will not be processed or reimbursed. g. Claim for reimbursement of travel expenses of teachers or personnel from division office shall submit the documents already pre-audited by the division accounting personnel or by the bookkeepers assigned in their respective district. The regional office focal person or program coordinator will be responsible for the compliance. 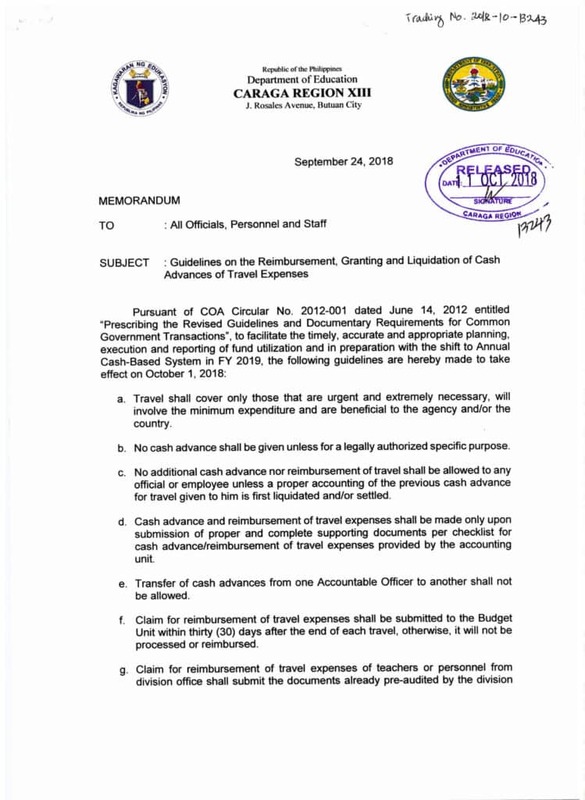 h. The accountable officer shall liquidate cash advance for travel within 30 days after the return of the official /employee concerned to his official station for local travel and within 60 days after the return of the official /employee concerned to the Philippines in the case of foreign travel.